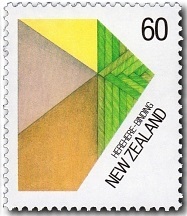 This issue features a Maori view of the use of natural fibre is the subject of this four stamp issue, designed by Nga Puna Waihanga (an organisation of Maori artists, writers and designers). 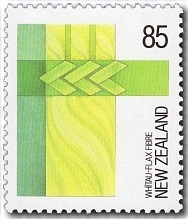 The designs featured on these stamps are graphic representations that embrace broad concepts of the working of fibre such as knotting, binding and plaiting. To the Maori people, indigenous fibres had qualities embracing all aspects of living as well as providing a medium for art and craft. Cultivation, harvesting and preparation methods and rituals were carefully adhered to by Maori people and reflected the extent to which they depended on fibre products for trapping, snaring, cooking, storage, building, clothing and other utilitarian purposes. Today, Maori weaving and crafts have taken on the new purpose of an art form and training medium for young people. All my other posts on Maori subjects can be found via our New Zealand Maori index. 40c - Pona - Knot. The knotting process is used in both simple and complex ways. Its basic function is to make articles secure. In its most developed forms, it parallels weaving techniques. The torehe or fishing net shown here provides an example of this knot. 60c - Herehere - Binding. Binding and lashing is basic to a wide range of articles from the making of fish hooks to the much larger constructions of canoe and house building and demonstrates the bringing together of different materials. The matau or fishhook is made up of two or more different materials and a typical binding is illustrated. 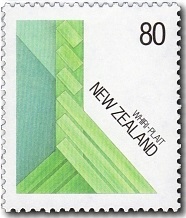 80c - Whiri - Plait. Plaiting is a highly developed art and craft form using 2 to 9 strands and has the particular effect of strengthening the fibre. A basic plait being made is shown. 85c - Whitau - Flax Fibre. Fibre that has been extracted from the green flax blade and processed to a fine pliable material may be used in many specialised ways. The significance of depicting whitau relates to the special lengthy preparation which results in a highly valued fibre. Korowai or cloak weaving is shown in this design. 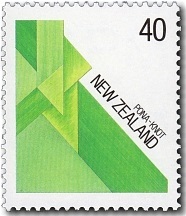 First Day Cover - 4 November 1987.